The Run of Fleet option means that the type of vehicle allocated to you is not confirmed until the day you pick up your rental. With this option, you agree to accept either an MH-A, an MH-B or an SVC (see specifications sheets below). The "ROF 4" option is available for up to four adults for the MH-A and MH-B and two adults and 2 children for the SVC. 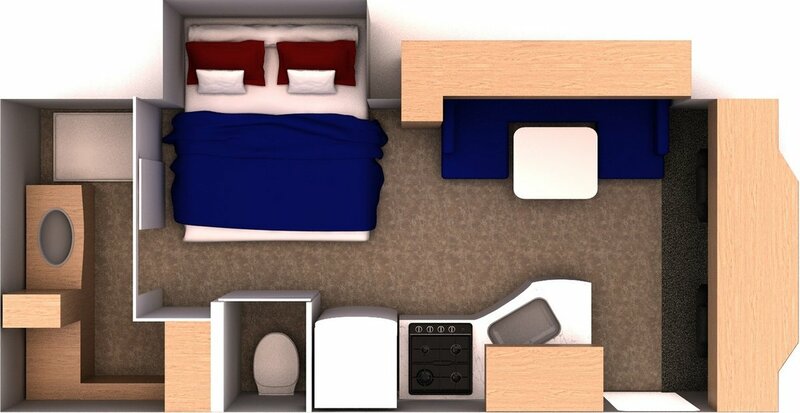 All of our units have a shower, toilet, refrigerator and cooking facilities. * It is important to note that in this unit there is only 1 fixed tether anchor, so while it might be possible to house more than 1 child/infant seat, only 1 can be fixed to the tether anchor. The other will need to be attached solely by the lap belt. 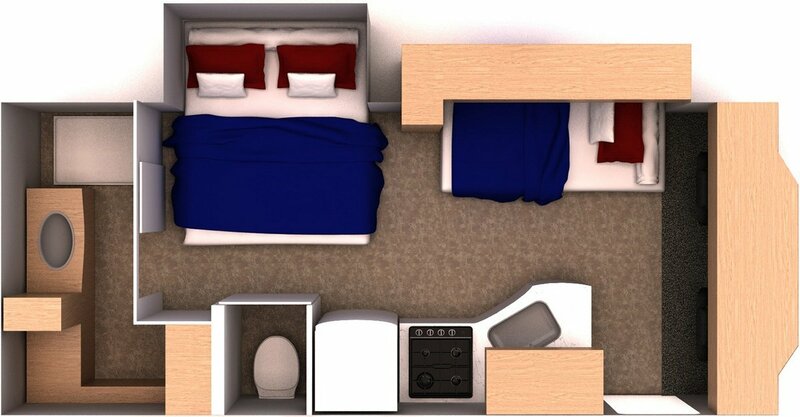 2 single overcab beds, 2.5 x 5.92 ft.
Actual layout may differ from that shown in the floor plan. There are several types of vehicles for any given category. Children under 6 months old are permitted. Minimum age required: 21 years old. Founded in 1995, Canadream is one of Canada 's leading RV rental companies, coast to coast, with a fleet of 800 vehicles. Specials on kilometres, bedding and kitchen equipment ensure a reasonable price for a high quality RV. However, these offers are only available with early bookings (before March). FREE GPS RENTAL (exclusive to Authentik Canada). The supplier with the greatest number of rental locations across Canada , from Halifax to Whitehorse . Highly practical for one-way rental. High quality, recent vehicle models. Several specials and promotional offers for clients who book early. $0 deductible option in the event of vehicle damage (available only on Authentik Canada 's website). ROF (Run of Fleet) option provides significant savings for flexible travellers. The exact vehicle is known only at pick-up. Airport transfers are included (with the exception of Montréal). Most of the locations are open on Sundays during summer time. Vehicle availability in high season is quite limited, especially for last-minute bookings (April or later). The morning pick-up and afternoon drop-off option is somewhat expensive ($425). Transfers to and from Montreal location are not offered.